I had fun making the card for tonight. It's a darling image but I did have a problem finding the perfect sentiment in my stash for it. Next time I think I will just print my own. This is an adorable Mo Manning digi image. I colored her with Copics and Spicas. The template comes from Sketch Saturday. The sentiment is from A Muse, ribbon is from stash, and the dp and button are Basic Grey. Oh that saying is so perfect. I will remember that for future use!!! Thanks! This is just too adorable! Great colors and very nice composition! Very Nicely done! Thanks for playing with us this week at Shopping Our Stash! This is a great card...and the colors all go perfectly. You are a master with paper matching. Somehow I feel like this is a card for me..due to once again getting ahead at Candy Crush. LOL Don't worry, you will catch me sooner than you think...I'll be on this level forever! 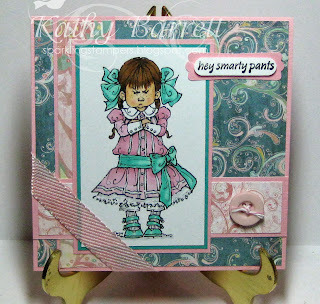 Love your gorgeous card, fabulous image she does make me chuckle. Very beautiful card! Thank you so much for playing along at Card Mania! Good luck!